I have moved around a lot (not just houses, but countries too! ), so when we bought our old house I was happy to settle there for a while. I knew we'd eventually move again when the bubbas came along, but I wanted, if possible, to move once to what would (hopefully) become our "Forever Home" (well, the family home, where we'll raise our children until we kick them out they go live their lives and we retire to some tropical country somewhere). Fortunately, it seems we may have just done that. As mentioned before, we were so happy with the fact that there was more space in the new nest - about double the space, actually! Finally, the kids have more space to have all their toys out (i.e. not in the loft) and play indoors on cold and rainy days; everybody has their own bedroom, so there should be no baby disturbing toddler at night and vice versa, and no baby disturbing grown ups (well, that was the theory - there still seem to be 4 of us in our bed pretty much every morning! ); we can put our mark here (more on this later) and make it our home. 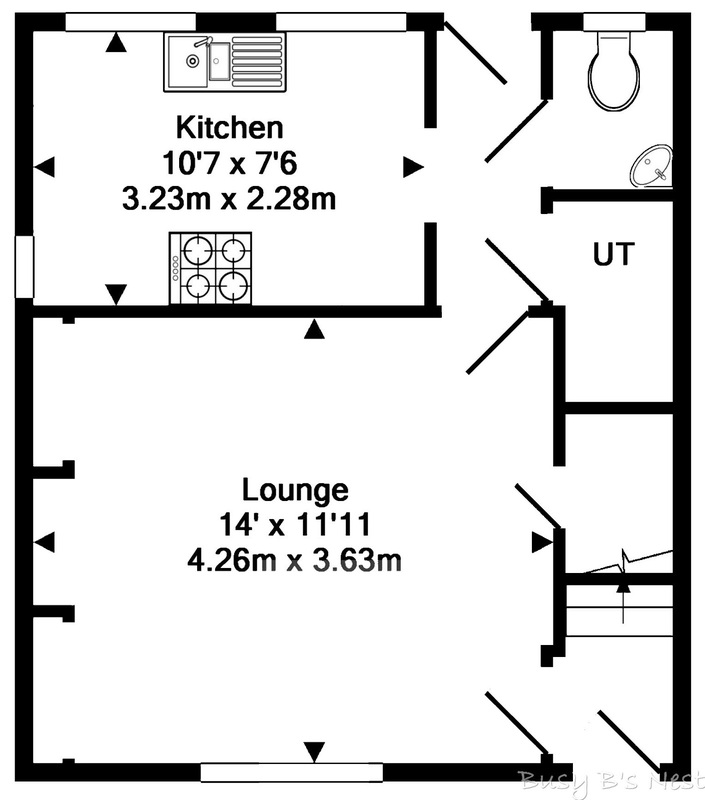 So, downstairs we have 2 receptions (if you include the conservatory), whereas the old house had 1 (smaller living room). This makes a massive difference in our lives, since these are the areas where we spend most of our time. The kitchen here is a bit bigger, although the storage and space usage don't quite work for me - more on that later. This house has a hallway (I have always wanted one! ), whereas the other one was a open-the-front-door-and-go-straight-upstairs sort of entrance. The staircase here is more attractive and interesting, compared to the straight and narrow one in the old house. As the rest of the house, we don't have to do anything to the rooms downstairs immediately, as it appears to be in good order - except for a couple of walls, which are really not to our taste. But, obviously we want it to have our stamp and we have plans for all the rooms, which will be done as time and finances permit. I will share more details of the plans and progress of each project/room as we go along. But, the general plan is to do try to do things once, with a long-term view and minimise the amount of work we do with the just-do-a-cheap-and-quick-job-for-now approach. This means it will take a long while to for us to do everything we want, but in the long run it will hopefully mean less work and expense. In the meantime, we will get on with planning, budgeting and doing what we can with the materials and tools we already have (or can afford to buy now). The first room we will tackle is the living room (actually in progress as I type this), followed by the hallway downstairs, because we are anxious to replace the carpet in there with laminate flooring (due to some not so pleasant dog smell - despite hoovering, cleaning with a carpet cleaning machine and deodorising!). So, we need to decorate in there before the new flooring is fitted. Watch out for the next post very soon!